Two decades ago, leaving the European Union was a minority pursuit. Now British politics is defined by Brexit. Danny Dorling explores how the radical right has grown and why its dreams of reviving Britain’s imperial ambitions are likely to fail. As the summer headline in the Guardian tried to make clear: ‘Moderate Tories need to understand: the extremists are unappeasable’. You would have thought that moderate Tories would understand their less moderate colleagues better than a liberal Guardian newspaper columnist; however sometimes, when you are too close to someone you have known for many years, it is harder to see the reality of their position. You look for the good in your political party colleagues. Moderate Tories in Britain have confused the bombastic style of hard Brexiteers as simply reflecting countless evenings practising such peacock behaviour at Oxford, Cambridge or Durham Union debates. Dressed in a dinner jacket and bow tie at Oxford, Jacob Rees Mogg and his chum Boris Johnson may have appeared to be sharp-witted buffoons; but they were practising, practising for the high point of their ever so important lives to be, for the final act, for their moment of triumph. They have been on a mission. As the first autumn leaf of 2018 fell, Boris Johnson proclaimed that ‘the UK had gone into battle with the white flag fluttering over our leading tank … [and would] throw away most of the advantages of Brexit’. The former Foreign Secretary was arguing for a hard Brexit, for what Jacob Rees Mogg’s father had also long sought. In 2008, Lord William Rees Mogg, former editor of The Times had claimed that a liberation was coming and those: ‘who will gain most from this liberation [will be] the brightest, most successful and ambitious’ among us, those who can educate and motivate themselves …. Genius will be unleashed, freed from … the oppression of government…’. William died in 2012, but his ideas – these ideas that the English radical right have held dear for so long – live on stronger than ever today. The UK’s move to the right was orchestrated. In the 1980s ether were few far-right candidates in European Union elections in the UK and those few who did stand barely scraped together a tenth of a per cent of the total vote. Only one in 1000 voters were voting for parties wanting to leave the EU. However, in the 1990s the far-right vote began to rise with the birth and funding of the Referendum party which in turn was quickly overtaken by Ukip’s growing strength. Economic inequality rose greatly, but most of the woes it caused were wrongly blamed on immigration. 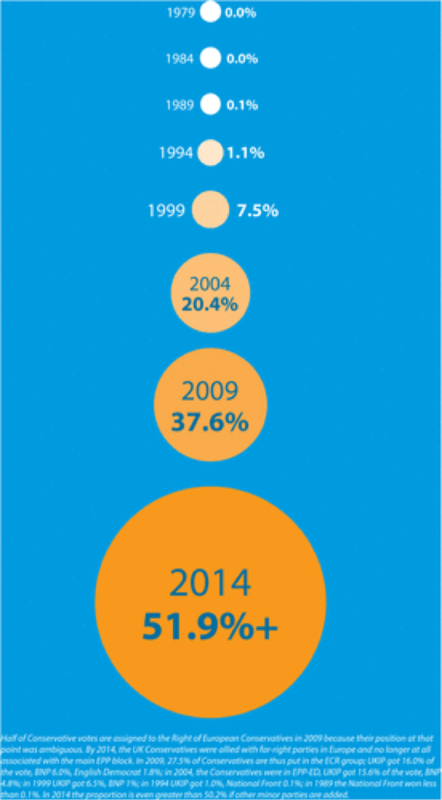 In the 2000s the radical right’s presence in the UK continued to grow. The Conservatives were often part of this shift, especially after 2009 when the Tories left the mainstream group of European Conservative parties in the European Parliament to join the European Conservatives and Reformists, a grouping that includes the far-right Sweden Democrats and the Danish People’s Party. By 2014, the Conservatives were fully engaged with the far-right of mainland Europe in a grouping that was clearly divorced from normal European Conservative behaviour (see Figure 1). By the 2014 European elections, the writing was on the wall: Ukip topped the polls for the first time in a national election. But the results were generally ignored because turnout was low and we did not think the EU was a very important issue in British politics. That all changed two years later. English and Welsh districts of: Allerdale, Barrow-in-Furness, Blackburn with Darwen, Blaenau Gwent, Carlisle, Cleveland, Craven, Copeland, Hyndburn, Knowsley, Lancaster, Lincoln, Pendle, Redcar, Ribble Valley, Richmondshire, Rochdale, Rossendale, Rutland, Ryedale, Selby and Scarborough. 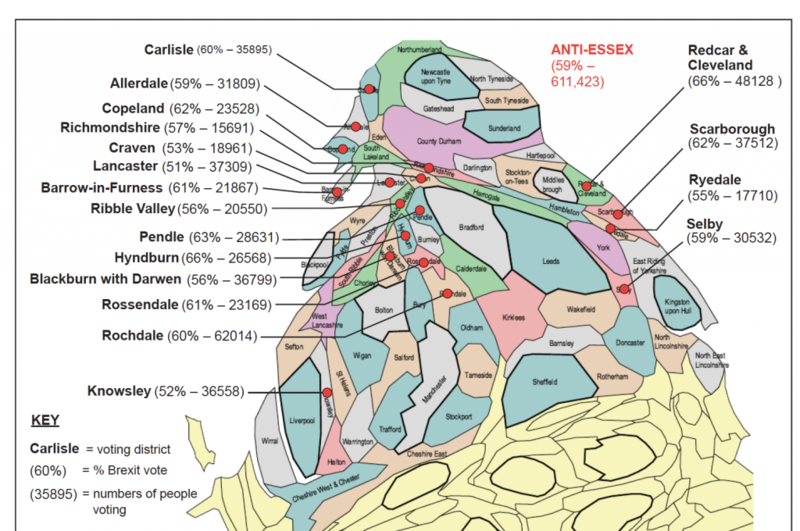 All of those 22 northern districts and counties also voted out, just as Essex did. Combined they had a larger electorate than the county of Essex. But because turnout in the North was lower, and enthusiasm for Leave was lower, those 21 areas had fewer total leave voters than Essex. The capital of Brexit was Essex. The Leave vote was won in the larger white, middle class commuter county surrounding London. It was won by persuading very large numbers of people in southern-middle England that membership of the EU was terrible for them, their children and their grandchildren. Brexit was made in the Home Counties in the South of England. Here is a second example using a different set of areas. There were more Leave voters in Hampshire alone than in all of the following places combined: Derby, Blackpool, Leeds, Sheffield, Great Yarmouth and Merthyr Tydfil. Again, these seven districts had a higher electorate than Hampshire. They include Britain’s fifth largest city – Sheffield – now known as a key area of Leave. It was presented as a surprise on the night that a city with a Russell Group university should vote out. 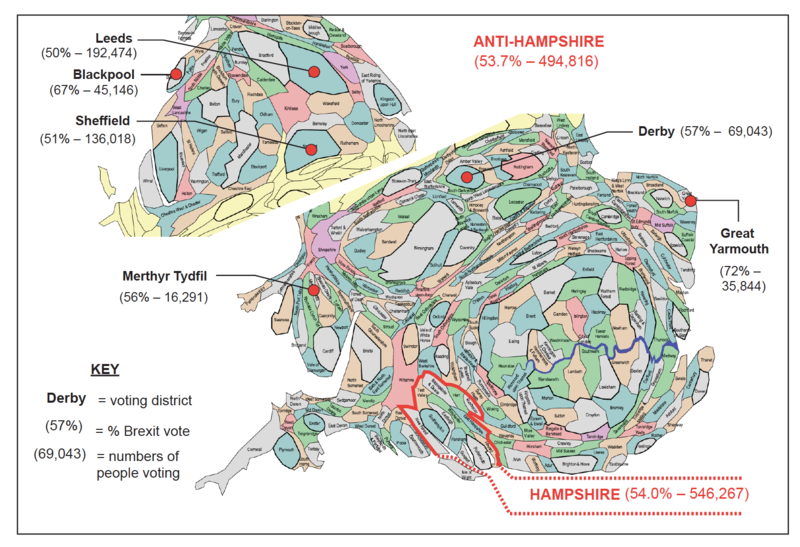 Hampshire is hardly associated with Leave and yet both a higher proportion and a higher number of people voted to Leave in Hampshire than in these combined northern, Welsh and English East Coastal areas often seen as being synonymous with Leave. How could we have missed that? Here is a third example for you, again using a different set of areas – again areas often associated with Leave in the popular imagination. 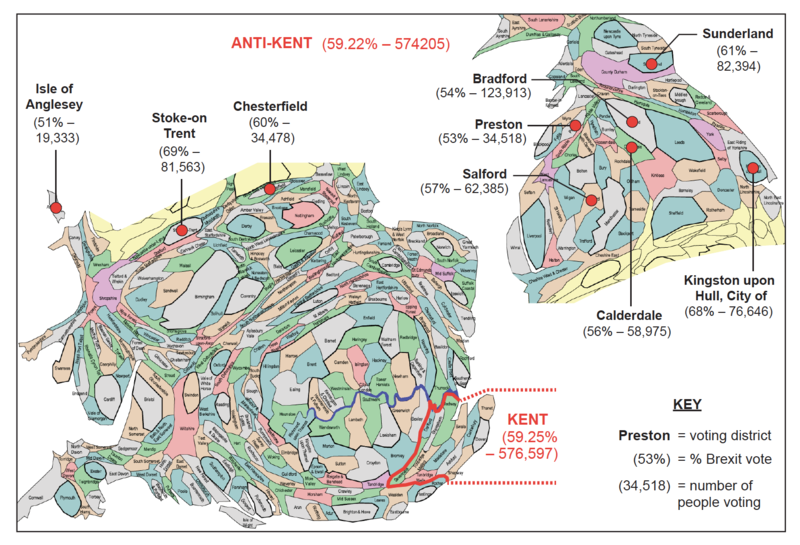 More people voted Leave in Kent, alone, than in all of Anglesey (Ynys Mon), Bradford, Calderdale, Chesterfield, Hull, Preston, Salford, Stoke-on-Trent, and Sunderland combined. You almost never hear of Kent as being a hot bed of Leavers. Why would somewhere that benefits so much from being the closest county to the continental mainland vote to Leave, and yet it did – with far more enthusiasm and effect than those places such as Stoke and Sunderland now so well associated with Brexit. These lists could be continued to include the remaining eight Home Counties of Bedfordshire, Berkshire, Buckinghamshire, Cambridgeshire, Hertfordshire, Oxfordshire, Surrey, and Sussex. And each of them could be counter-balanced by very long lists of places further away from them that were less enthusiastic centres for Leave. The cheerleaders for Brexit were a group of young men, including the better known (but still largely in the shadows) Matthew Elliot and Dominic Cummings, and a coterie of less well known cheerleaders from think tanks such as the Adam Smith institute. Others on the political radical right were less enthusiastic but still supported the cause, including Kristian Niemietz and Christopher Snowdon of the Institute for Economic Affairs, a libertarian think tank that views European regulation as meddlesome and the UK as having one of the worst nanny-states among Europe’s many so-called nanny-states. Without Brexit, they could not achieve all that they desire. What this group had in common was a desire for a survival of the fitness, nastiest, greediest, most-selfish, least-other-wise-concerned-for-others, future. For many in this group, sovereignty meant the freedom not to be interfered with as they, and their masters with the money, went about their personal missions to better-off themselves. A sovereign UK could be their safe space, their treasure island with very low (even almost no) taxation in future. But, in trying so hard to secure this goal and coming so close, they made the very opposite of their dreams much more plausible. Brexit could well break up Britain, but before it does that it could require a great deal more money to be collected in tax to deal with the fall out of trying to leave. Britain is an odd political entity. There are only a very few times I hear the word British used. I often hear it when Unionist politicians from Northern Ireland speak, which is interesting as the North is not part of Great Britain. I hear it from Theresa May who, along with many other Conservative and Unionist politicians, appears quite wedded to the phrase and idea. The only other time I hear it is when people describe themselves as ‘Black British’ (because the phrase ‘Black English’ never caught on). And, of course, it is within the title of the now largely defunct ‘British National Party’. The idea of Britain was a relatively recent invention. It was created from a marriage of convenience between Scotland and England at the point when it was in the interests of the elites of both countries to work closer together. There was an empire to build and Spanish gold to raid. Britain is really the name of an empire, not a state. As empire has faded, membership of the EU has been helping to keep Britain together. The British Empire has a certain ring to it, but when that empire finally goes, so will the word British. Some Victorians tried to call Scotland ‘Northern Britain’ – that never caught on either. Britain is a temporary name, borrowed from part of a Roman colony that famously did not extend further north than a wall, the ruins of which run through what is now northern England. The idea of Britishness is already dying out. It mattered a lot to people like Halford Mackinder. He was a Conservative and Unionist MP, establishing the School of Geography at Oxford to help produce colonial officers, among much else. Brexit accelerates the demise of Britain, which is ironic, as many of those who paid for Brexit, who channelled funds through the Democratic Unionist Party to campaign for it, and who have been working for most of their lives to achieve Brexit, take the idea of a British Union very seriously. Many may hold similar beliefs and have similar motives to Halford. The empire was very important to Halford. The word ‘Britishness’ is especially odd. Asking someone today what kind of Britishness would you like to see is a little like asking someone in Russia in 1990: ‘What kind of USSRishness would you like to see in future?’ or asking someone earlier from the time of the Ottoman Empire how they would like to see that geographic alliance in future. The word will hold a historical interest in the future, and will have a practical meaning for as long as the Westminster parliament has majority control over all of Great Britain and Northern Ireland. But, increasingly, it looks as if those days are numbered – partly thanks to the Brexiteers’ takeover. There is no longer an empire to exploit and it’s not coming back. The question is how to achieve an amicable divorce on the British Isles. Brexit, for instance, has taught the English that there is no border in Ireland now. Most never realised that. Brexit has reinforced the understanding of the Scots concerning how duplicitous the English can be. But it is a complete mess, as even London did not want Brexit. It was those living around London who did. Furthermore, without the English retirees living in Wales, Wales would not have voted majority out. These are a very divided set of Isles. Jacob Rees Mogg has one of the most unusual backgrounds. He grew up in the Rees Mogg family castle and from there, via prep school, and a second home in Smith Square, he went up to Eton and up again to Trinity – still today ranked one of the least progressive of all Oxford colleges. Rees Mogg’s upbringing was almost completely atypical but it was very similar to his dad’s early experiences in life, and those of Boris Johnson. One reason the Home Counties are thought to be called ‘home’ is that they were where that cottage in the countryside was located, with roses around the door, that you would eventually retire to after a lifetime spent avoiding the worst of Malaria and subduing the natives. It was where you came home to from the Empire. But the Empire is not returning. Brexit will not bring it back, and the British are quickly learning so much more about themselves than they ever knew. 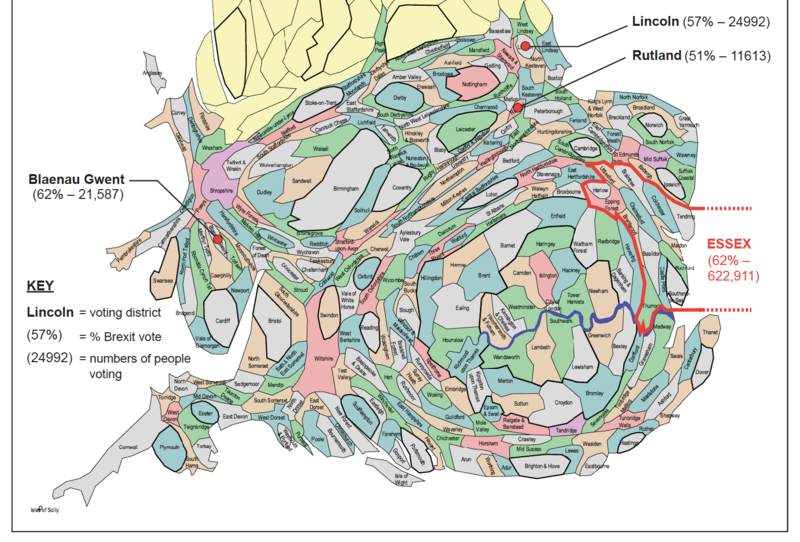 Danny Dorling is Professor of Geography at the University of Oxford. For a PDF of this article and the journal web page click here.